Protesters won’t get to displace bleachers at a key inauguration parade spot on Pennsylvania Avenue so they can stage an anti-Donald Trump demonstration, a federal appeals court ruled Tuesday. Act Now to Stop War and End Racism Coalition, known as ANSWER, had pressed a lawsuit seeking access to Freedom Plaza with the U.S. Court of Appeals for the District of Columbia Circuit. A three-judge panel ruled that the government has the authority to restrict demonstrations in the public space located between 13th and 14th Streets on Pennsylvania Avenue Northwest. ANSWER had argued that excluding any dissenting voice from the plaza on Jan. 20 creates a “free-speech exclusion zone” at the one location along the route where people can rally and speak as a group. It is also a highly visible spot on the parade route, located in front of the National Theatre. Stands for media broadcasts will be erected there, because its location at the bend on Pennsylvania Avenue offers the best view down the parade route with the U.S. Capitol in the background. The D.C. 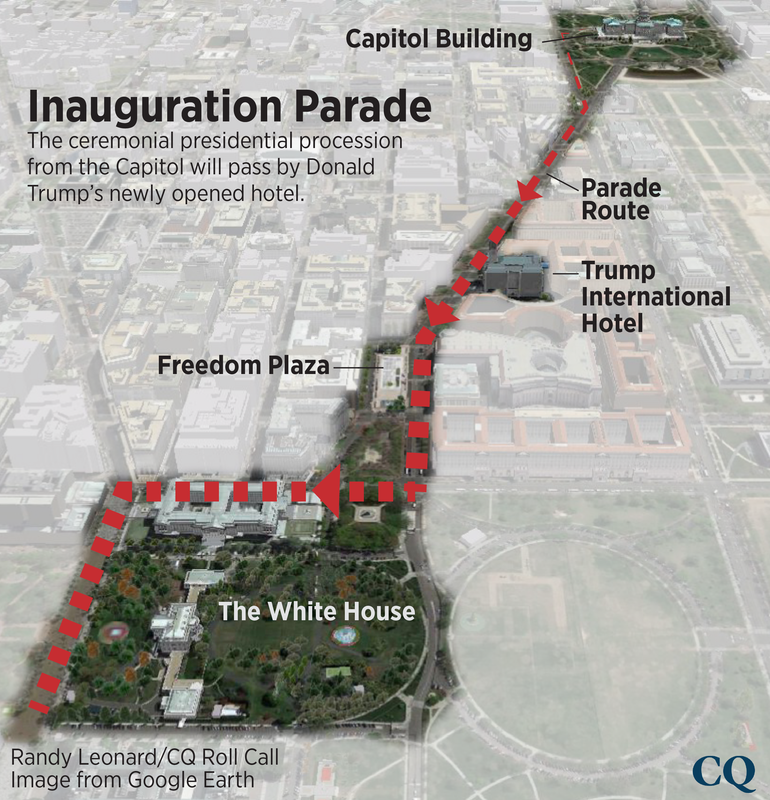 Circuit wrote that government regulations leave 70 percent of the footage along the parade route on Pennsylvania Avenue open to the public. Of the 30 percent that is not open, 13 percent is for Inaugural Committee bleachers. ANSWER said it has a permit to demonstrate on Inauguration Day at the Navy Memorial, on Pennsylvania Avenue between 7th Street and 9th Street Northwest, starting at 7 a.m. The protest could draw thousands, and the group is soliciting donations to cover the cost of buses, leaflets, placards and other expenses. Other protests are expected at the inauguration parade, and the next day. Protest organizers applied for 1,200 permits to park buses at RFK Stadium for the Woman’s March on Washington on Jan. 21, The Washington Post reported last week. There are 200 permits for bus parking at the stadium for Inauguration Day, the newspaper reported. The inauguration parade route has another spot rife with potential conflict between protesters and parade-goers — the Trump International Hotel at 11th Street Northwest and Pennsylvania Avenue.